Last week, HART was in Uganda to celebrate 10 years with the PAORINHER HIV clinic and its amazing achievements. We will be releasing our visit report in the coming days along with some photos from the trip. With HART celebrating PAORINHER’s success in Uganda, this week’s blog takes a look at the current HIV situation in Uganda. HIV rates have fallen in recent years, yet women still suffer a disproportionately higher rate than men. Why the difference? Read more here. 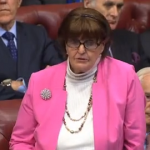 Baroness Cox has put several questions to the UK government this week about human rights abuses in Sudan and Burma. Below is a small selection, but more can be found here. To ask Her Majesty’s Government what changes they have identified regarding the protection of human rights in Sudan, in the light of their support for the decision taken by the government of the United States to lift sanctions on Sudan. The UK remains concerned about the human rights situation in Sudan, and Sudan is a Human Rights Priority Country for the Foreign and Commonwealth Office. We used the fourth session of the Strategic Dialogue this month to agree on steps that the Government of Sudan would take to make further progress on human rights issues. We raised discuss specific issues including sexual and gender-based violence, freedom of religion or belief, freedom of expression, and the Convention Against Torture. The UK welcomed the decision made by the United States permanently to lift bilateral economic sanctions on Sudan, following its judgment that progress had been made in five key areas. These included humanitarian access to conflict-affected regions, non-interference in South Sudan, and maintaining the Government’s cessations of hostilities in Darfur and the Two Areas. To ask Her Majesty’s Government what assessment they have made of the military’s role in the persecution of religious minorities throughout Myanmar, including in the Shan and the Kachin States. The British Government remains deeply concerned by the persecution of the Muslim Rohingya population. There have been reports of rapes, killings, burning of villages, and the use of landmines; 536,000 refugees have fled over the border into Bangladesh since 25 August. The Burmese military is responsible for the brutality inflicted on the Rohingha and the ensuing humanitarian catastrophe. We also remain deeply concerned over continued human rights abuses in Burma’s ethnic border areas, especially in Shan and Kachin where hostilities are still taking place. We have repeatedly called on the military to end hostilities comprehensively and have called on all sides to enter into dialogue towards a sustainable and comprehensive nationwide ceasefire and political reconciliation process. Live in peace, Suu Kyi tells Rohingya in flying visit – Burma’s leader made her first visit to the country’s flashpoint state since an army offensive drove more than 600,000 Rohingya Muslims to flee across the border to Bangladesh. US wants talks on Rakhine crisis but sanctions possible – The US wants a diplomatic solution to the Rohingya crisis but is not ruling out sanctions to pressure Myanmar if needed, a senior State Department official said Sunday in Bangladesh. – Azerbaijani-Armenian Civil Peace Platform may visit Yerevan – Last week Tbilisi hosted the First General Assembly of the Armenia-Azerbaijan Civil Peace Platform, the Platform showed that it has every opportunity to become one of the serious assistants for resolving the long-standing Armenia-Azerbaijani Nagorno-Karabakh conflict. Participants of the 1st General Assembly of the “Armenia – Azerbaijan Civil Peace Platform” made an appeal to OSCE Minsk Group. –Africa’s Richest Man Aliko Dangote Pledges $100 Million To Fight Malnutrition In Nigeria – Aliko Dangote, Africa’s richest man, has pledged to invest $100 million over 5 years to tackle malnutrition in Nigeria’s worst affected regions. –Fulanis Raise the Alarm over Incessant Attacks, Killings in Plateau -The Miyetti Allah Cattle Breeders Association of Nigeria (MACBAN) in Plateau State has raised the alarm over the increasing rate of attacks and killing of Fulanis in virtually all parts of the state. -Hunger rises in South Sudan in “man-made tragedy” – Harvest season is bringing little relief to millions of hungry people in South Sudan as conflict and hyperinflation have pushed malnutrition to critical levels that could put many lives at risk, food security experts warned on Monday. –Sudan-South Sudan border crossings ‘not open yet’ – The border crossings between Sudan’s West Kordofan and South Sudan are still closed, despite the recent agreement between Khartoum and Juba to reopen four of them. –Sudan: Ex-detainee held by armed group speaks about the experience – The International Committee of the Red Cross played the role of neutral intermediary in a handover operation in March 2017 that saw the release of 125 detainees, most of them from the Sudanese Armed Forces. Uganda: Govt rolls out stronger TB drug for children – Children suffering from Tuberculosis (TB) have started receiving a stronger and more user-friendly drug for treating the expected to improve treatment outcomes.